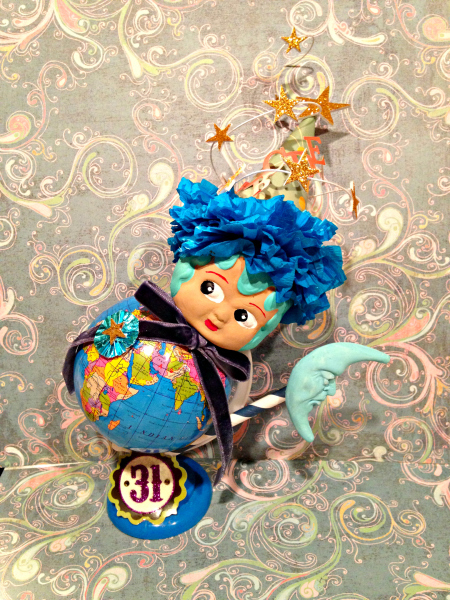 Wizard Wimbatte Flies the Globe, Altered Assemblage piece created using products in my line: The XL Cupie Head in Aqua part of the Cupie-ology line, the Small Globe base in my line, and various other goodies, also available as a kit! The Story "Set sail on an adventure around the world with Wizard Wimbatte while she brings you on the journey of a lifetime. Stop off for tea and magic studies hour at the Tower of London, then rest over at Big Ben before your next stop at the Eiffel Tower.